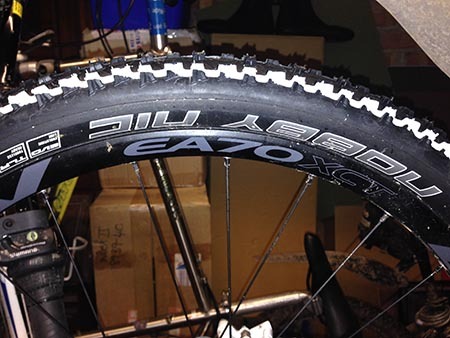 Ever since I started on mountain bikes, a scary thirty years ago, I have preferred a tyre with a square shoulder. In the early days this was offered by the Specialized Ground Control and that tyre gave me huge confidence… in recent years I’ve dabbled with newer Spesh’ tyres and Continentals, but these Schwalbe Nobby Nics have proven to be revelation. They are nominally a winter-biased tyre with an aggressive raised tread consisting of large knobs (hence the name) – in the winter this gives good mud and wet weather traction, but it works equally well in dry and dusty conditions. Next PostVeloton – best coffee in North Wilts and it sells bikes!